Trust’s overall condition has been improving over the past few days. Her mouth (mucous membranes) is moist and pinker, and she is becoming more feisty and regaining her appetite. All are signs that the internal bleeding is resolving and she is feeling better. On Friday, March 11, we removed Trust’s wing wrap to do some physical therapy on the injured wing. Physical therapy is an important part of wildlife rehabilitation, just as it is in human rehabilitation. It is necessary to keep the joints mobile, and the skin and muscles elastic and flexible while the fractured bone is healing. The following videos were taken during Trust’s PT session, after we removed the wing wrap. We normally keep raptors hooded during treatments such as this, because it reduces stimulation (and hence stress) on the birds and keeps them quiet. We have found with Trust, that she seems to prefer to see what is going on, and will often stay quieter with the hood off. However, we do need to use the hood when it is safer for the handlers to do so. Following physical therapy, we reapplied the wing wrap so that her fractured coracoid can continue to heal. The following video shows that procedure. Trust ate the better part of a Red Perch (fish) earlier today. These days, she waits until she is alone and things have quieted down before she eats her fish. In the evening, however, it is a different story. Her dinner is venison, with medications inserted (but don’t tell her). When she spies the venison, she is much more aggressive about eating than she is with the fish. She doesn’t even wait for me to put down the plate! Wow, folks! Where do I begin? The past two days have been a whirlwind! Your show of support has been incredible. 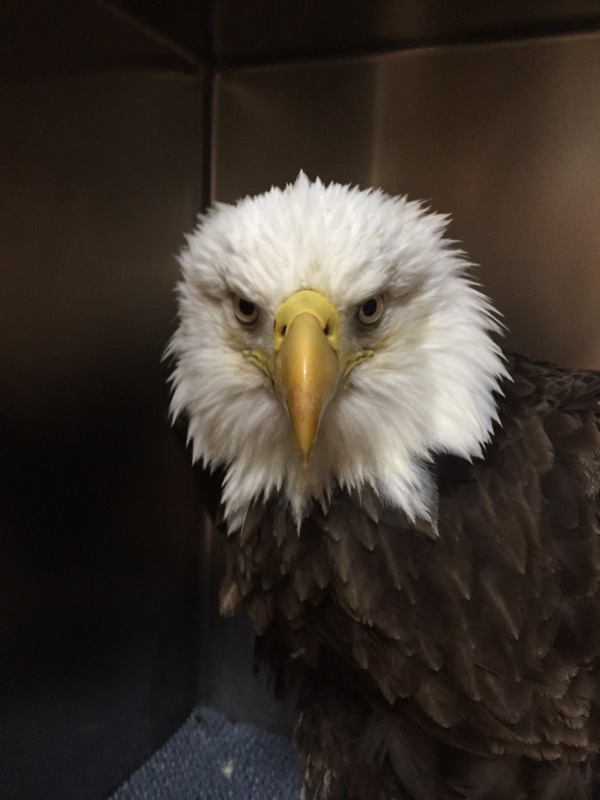 I am grateful to all of you for your caring concern about this beautiful creature, “Trust,” an American Bald Eagle, that has been placed in Owl Moon’s care. To update you, we brought Trust to Bennett Creek Animal Hospital this morning, where we took radiographs, and Dr. Debbie Deans examined her to get a clearer picture of her injuries. We learned that she has a fracture in her left shoulder. The coracoid bone, which runs from her shoulder to the breastplate was fractured mid-shaft from an impact, presumably caused by a motor vehicle. The coracoid is an important bone for flight because it supports the shoulder during the pull of the downstroke. Therefore, the prognosis for her returning to full flight is guarded. We have wrapped that wing to her body to immobilize it for at least 3 weeks, so the fracture can heal. We will remove the wrap periodically to do physical therapy and keep the joints mobile. We are not certain that our efforts will be successful, but we will give her the best possible chance of recovery of flight. Another thing we learned from the radiographs is that there was some trauma to Trust’s cranial air sacs from the impact. Air sacs are part of a bird’s respiratory system. We think she can recover from this, but it is affecting her breathing, and there is still a small amount of internal bleeding evident in her mouth, so she is not completely “out of the woods” yet. She is, however, alert and on her feet. She went off her food for much of today, but tonight she regained some appetite when we put a quail at her feet. I am posting a few pictures here, and a video of Trust eating fish, on our website. I will write more tomorrow. Thank you again for your support, and for your financial contributions to our efforts. Donations will be used to purchase fish and fowl, to feed Trust, and to care for the many hawks and owls under our care. We appreciate it!!! Please keep Trust in your thoughts and prayers.